Il Papa, meet one of the godfathers of modern cinema. 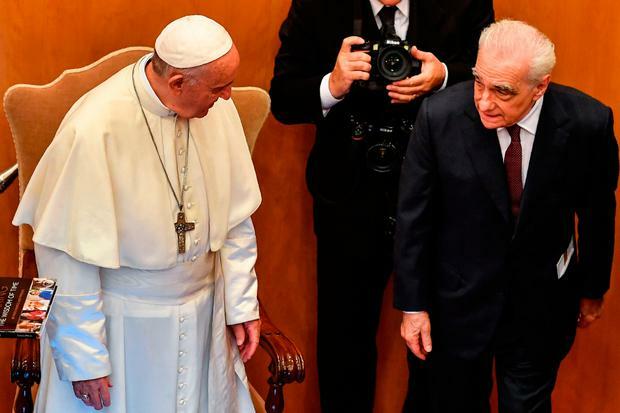 Pope Francis met Martin Scorsese in Rome - three decades after his film 'The Last Temptation of Christ' was deemed "morally offensive" by the Catholic Church. They met at the end of the presentation of the book 'The Wisdom of Time', a collection of 250 interviews from over 30 countries, with various stories of old and young people presented by Pope Francis. In conversation with Scorsese, the Pope warned of a world that is becoming more and more cruel. "People act with more cruelty… cold cruelty, calculated to ruin someone else's life," said the pontiff. Pope Francis answered questions from people as young as 20 and as old as 83. It is not the first time that the legendary director has met the Pope, as Francis received Scorsese, his wife and two daughters in late 2016. It is now 30 years since the Oscar-nominated 'The Last Temptation of Christ' sparked outcry among many Christians. Argentina, where Francis was born and served as a cardinal, was among the countries that banned the film. Separately, the Vatican laid the groundwork to open formal debate on an issue that has long been taboo: opening up the priesthood to married men in parts of the world where clergy are scarce. Pope Francis has convened a meeting of South American bishops next year focusing on the plight of the Church in the Amazon, a vast territory served by few priests. The question of ordaining married men is expected to be on the agenda. Claire Hayhurst and Rod Minchin Boris Johnson's sister Rachel is to stand as a European election candidate for Change UK, the pro-remain party set up by The Independent Group. Matthias Williams Before Ukraine's new president Volodymyr Zelenskiy was even elected, an opposition leader was plotting to curb his powers and make it easier for him to be impeached. Jennifer McKiernan Schoolgirl climate activist Greta Thunberg has told British MPs her future has been "stolen".